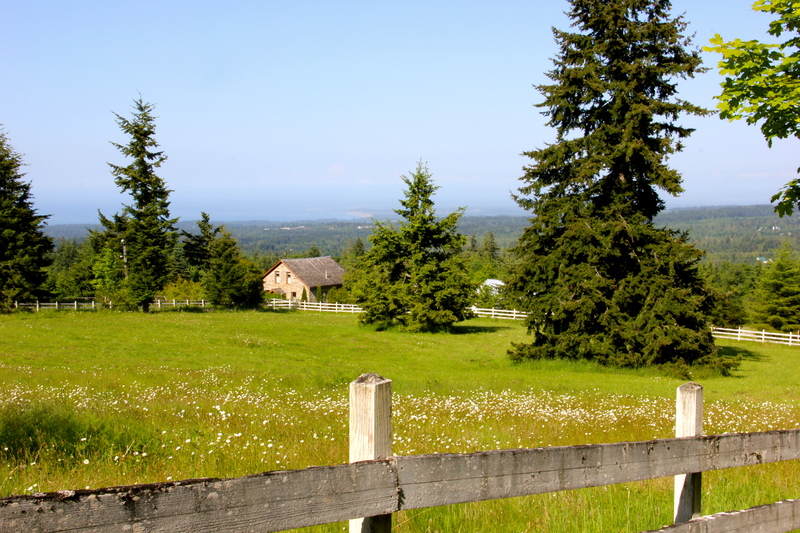 I took this photo of a section of my neighbor’s picturesque horse pasture from the top of my gravel driveway. There’s something about the crunch of gravel beneath my shoes and my tires that’s beginning to feel like home to me. When we turn onto Coppertop Trail, we turn from pavement onto gravel and continue on gravel all the way to the large, paved garage pad — perhaps the future site of a basketball hoop. That same gravelly crunch makes it impossible for anyone to arrive at our home without being noticed, so it’s a built in safety feature and notification system! 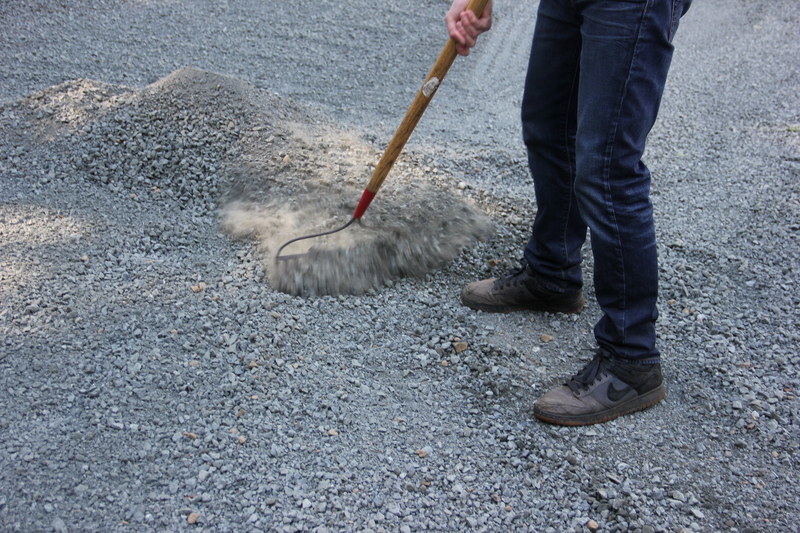 Gravel driveways have many benefits, one of them being that they are environmentally sound, allowing water to penetrate the earth below, replenishing groundwater and avoiding excessive storm run-off. 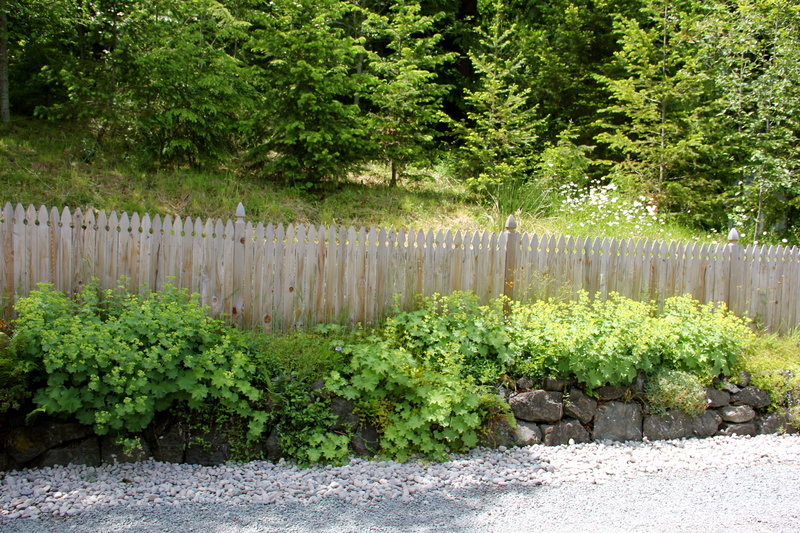 They are aesthetically appealing especially in country settings, adding a more natural element than pavement. Additionally, we have excellent traction on our gravel, and ice was never an issue in the winter. 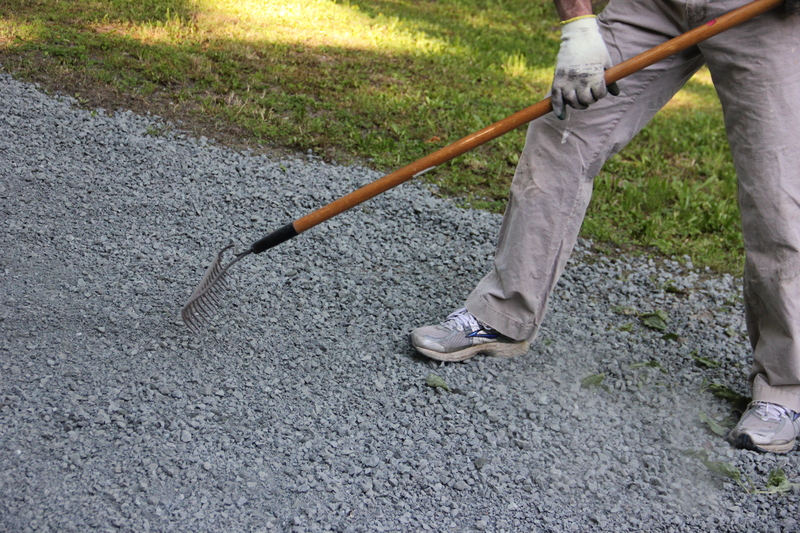 Gravel driveways are also relatively easy to maintain and are cost effective. 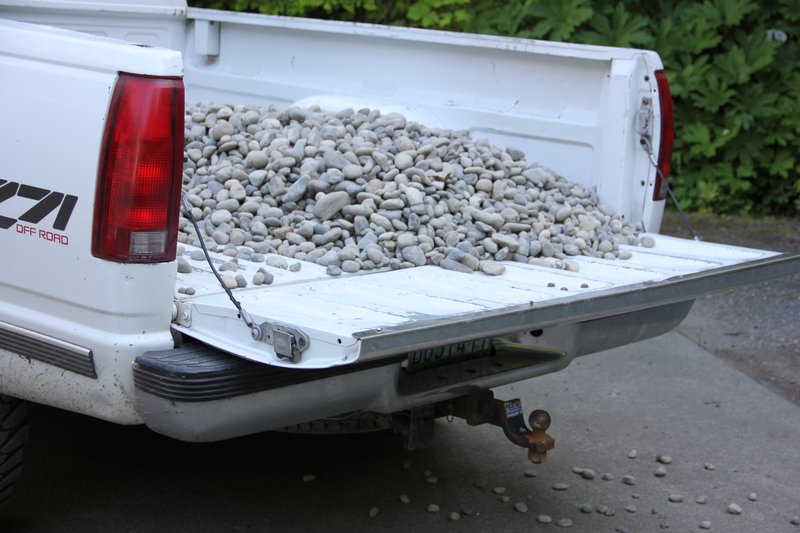 Owners of gravel driveways expect to have to top-dress every few years, depending on weather and amount of traffic. 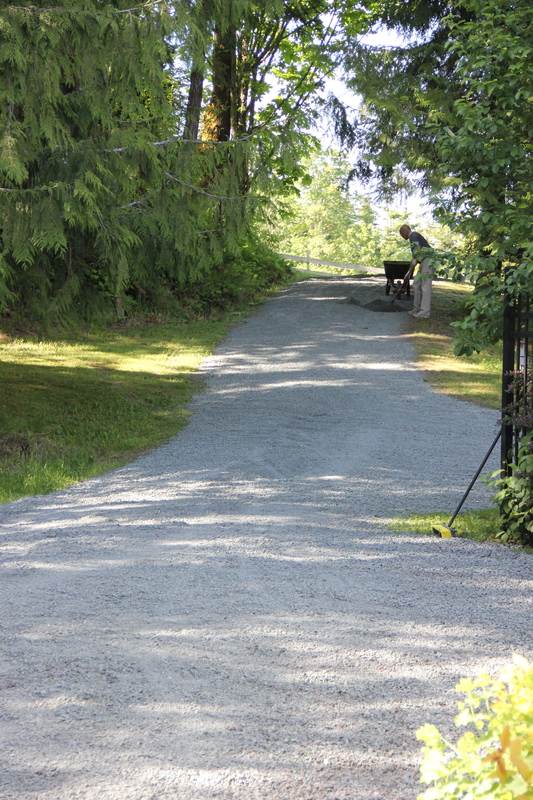 Our driveway needed a minor facelift after the cold, wet seasons plus the wear and tear from moving trucks and contractor trucks from some home renovations. So we had gravel delivered yesterday. The huge dump truck just fit below the branches of the treed driveway, as David, the driver, lifted and poured out the stone — 12 cubic yards, or over 16 tons of gravel. Late in the day, Hubby and Son got busy with wheelbarrows and rakes and redistributed the parts that were uneven. At the base of the rock wall, we have edged the gravel with drain rock resembling a variety of river rock, to revitalize the existing drain edge. Hubby stopped at the stone yard to collect this in his truck. These hardscape elements are not the most glamorous or colorful garden features, but they do catch and hold the eye and are functional. They also help Coppertop’s green spaces pop even more. This entry was tagged Coppertop, driveway, gardening, gravel, Olympic Peninsula. Bookmark the permalink.